I have to admit to being pleasantly taken by surprise by this album, especially having pre-read the band's biography. 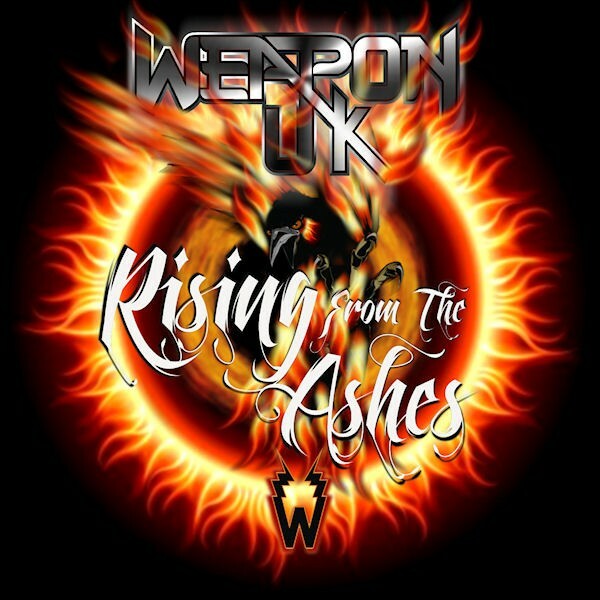 Weapon are cited as one of the major influences in the musical direction of a lil' ol' band called Metallica; indeed, the opening chords and drum fills from 'Hit The Lights' (from Metallica's debut 'Kill 'Em All') being lifted directly from Weapon's 'Set The Stage Alight'. Roll on thirty-four years and Weapon UK (name changed for legal reasons) finally release their sophomore album, aptly titled, 'Rising From The Ashes'. The pre-requisite intro 'Prelude – The Awakening' leads into 'Ride The Mariah! '(insert your own joke) that has a solid, Classic Hard Rock sound whilst retaining the attitude from their NWOBHM days. Original members, vocalist Danny Hynes (Paddy Goes To Holyhead) and guitarist Jeff Summers (Statetrooper) still remain and are joined on this album by a rhythm section of Ian Sweeting on drums and PJ Phillips and bass/backing vocals. It is Hynes with his ultra-powerful, yet melodic, voice and chief song-writer Summers with his classy riffs and guitar solos that vie for centre-stage. The album also boasts a fantastic production by the band themselves. Tracks like 'Fountain Of Paradise' and 'Warrior' remind me of the excellent Heavy Bones. The very catchy Rocker 'Ready 4 U' dates back to 2011 when it was released as an obvious choice for a single. It took a further three years to follow it up with the whole album; however, I have to say it was well worth the wait. The heaviest song on the album is the thunderous 'Burning Skies' with its Ozzy Osbourne 'Over The Mountain' sounding riff underpinning a fantastic track about the rise of terrorism in the East. 'Alamein' neatly changes the pace and is the vein of Scorpions classic ballad 'Winds Of Change' but without the whistling and features Roy Shipston on keyboards. 'Wonderland' is a great Bluesy Rocker, a la Wild Horses or Company Of Wolves, with superb backing vocals augmenting Hynes superb lead. 'Blood Soaked Rock' has an early Y&T vibe whilst 'Bad Reputation' has a sleazy L.A. feel whereas 'Celebration Time' has Summers soloing away like there's no tomorrow. The bonus track 'Killer Instinct', written by Hynes, features all four original members (Baz Downes on bass/backing vocals and Bruce Bisland on drums/backing vocals) and does have a totally different vibe to the rest of the album but is just as catchy nonetheless. As I said at the beginning of the review, not what I expected, however, with absolutely no filler, I have no hesitation in recommending this quality album for all lovers of Hard Melodic Rock. Let's hope that album three does not take so long to come out.